Synonym: Stipa coronata var. depauperata. 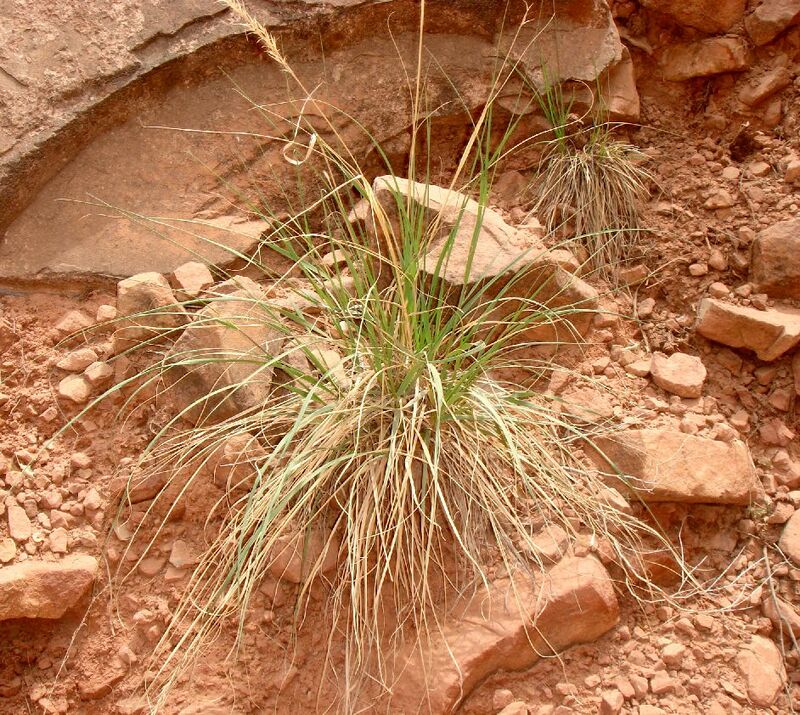 The 1987 Grand Canyon Flora says that this species has been reported growing in large clumps on slopes in Grand Canyon, especially along Kaibab Trail from 3500-5000 feet. There is only a single online voucher of this species from the Coconino County portion of the Grand Canyon, from Kaibab Trail. Achnatherum scribneri is a somewhat-similar species that has been reported growing from near the location of these plants. The 1987 Grand Canyon Flora says that A. scribneri grows on dry, rocky slopes along Bright Angel Trail, and north Kaibab Trail to Roaring Springs, Inner Canyon. Kearney and Peebles report that Hitchcock 10448 is of A. scribneri from the Bright Angel Trail between 5000 and 7000 feet elevation. (That voucher is not online at SEINet, so I can't check whether the determination of that voucher has changed.) Oddly, though, USDA Plants does not place A. scribneri in Arizona. There is only a single online voucher of A. scribneri from the Coconino County portion of the Grand Canyon, from 2.5 mile down the Kaibab Trail from the south rim. 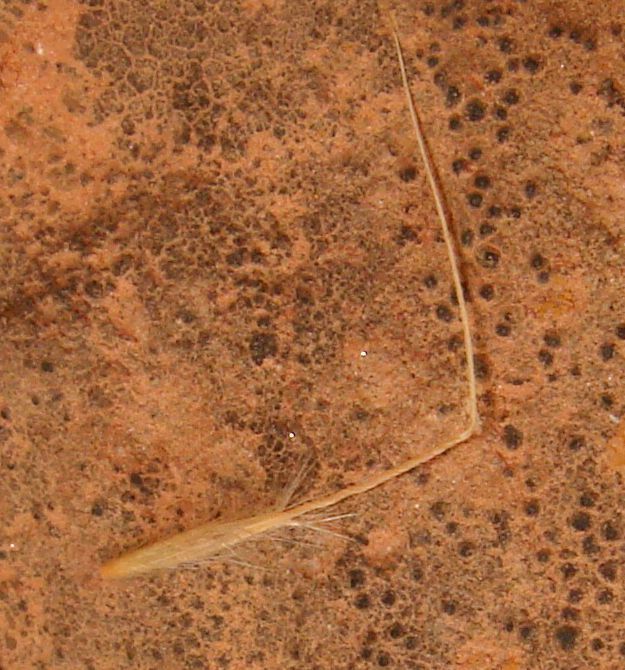 For the specimen in the photographs given below, Achnatherum scribneri is ruled out by the awn being bent once, not twice; the hairs at the lemma tip being 3 mm, not 2 mm or less; and the lemma body below the tip being long hairy, not short hairy. From a SEINet search on 17 May 2008, there is only a single voucher of this species from the Coconino County portion of the Grand Canyon, from Kaibab Trail. Note that there may be additional vouchers at other herbaria not available through SEINet. First occurrence on Bright Angel Trail: mile 2.2, elevation 5400 feet (1646 m). Number of plants along Trail: at least 20 plants were found in at least 9 different locations in May 2008. In the following picture, assuming that the lemma is 8 mm long, the hairs at the lemma tip are 3.0 mm long. It is difficult to see the long hairs on the lemma body below the tip, but there are several long ascending to nearly appressed hairs from the middle of the lemma body visible on the side of the lemma near the bottom of the photograph.